1 of 3 In a small bowl, whisk together vinegar, mustard, salt and pepper. Slowly drizzle in olive oil, whisking continuously, until mixture is evenly blended. Set aside. 2 of 3 Arrange lettuce over the bottom of a large serving platter. Break up tuna and place in the middle of lettuce. 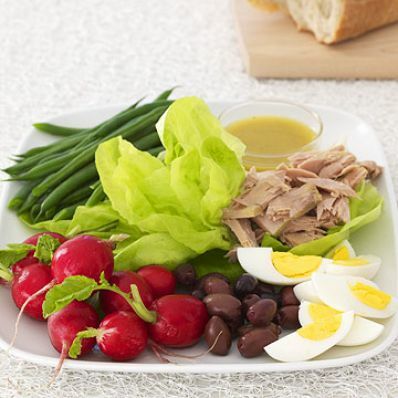 Arrange green beans, radishes, egg quarters and olives around tuna in a decorative fashion. 3 of 3 To serve, drizzle half of the dressing over the components of the salad. Serve remaining dressing on the side.